From Wikipedia: "In the process of setting electoral districts, gerrymandering is a practice that attempts to establish a political advantage for a particular party or group by manipulating geographic boundaries to create partisan, incumbent-protected districts." So what is one of the worst examples of gerrymandering in the country? What is the example that the national media uses when talking about gerrymandering? Illinois' congressional district 4, including parts of Chicago, represented by congressman Luis Gutierrez. Check out the map below and tell me if you don't think this is the most ridiculous political game ever. Apparently they had to run the district through the middle of Interstate 294 so that they could maintain a contiguous area of homogenous constituents. Leave it to Illinois to lead the nation in nasty politics. 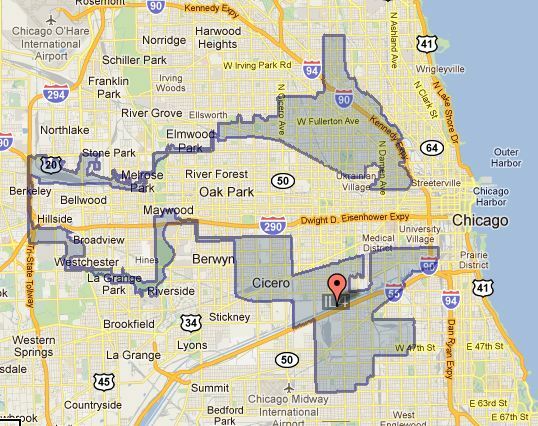 However, The Chicago Tribune reported today that Republicans are challenging recent congressional redistricting in court. I haven't seen the new maps but could they be any worse than this? I'm surprised this nonsense is tolerated. Why don't they just make a rule that districts can be defined with no more than 6 straight lines - or something similar? I am a big supporter of term limits. I know it will never happen (can't expect incumbents to vote themselves out of office), but that is all that will stop or severly limit this nonsense. I'm with you. You know what I would love...and it would never happen? The ability to impeach another district's congressman. Man, are there some clowns out there that I'd like to take down!